Our Garden Seeder Seed Plates are just one of the many features on the innovative design of our Hoss Garden Seeder. Our Seed Plates were designed with the customer in mind — with ease of use and affordability being very important. This design makes our Seed Plates the easiest to customize and the most affordable as compared to all other mechanical garden seeders on the market. So why is Seed Plate customization for a garden seeder so important? Can’t you just have a corn plate that will plant all varieties of corn? Not really. For certain crops like corn, beans, and peas, there are thousands of varieties available to consumers. 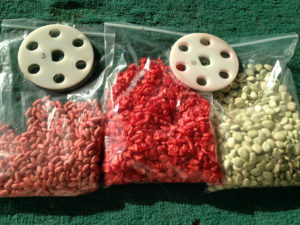 Each of these varieties will have its own set of unique characteristics which might include yield, disease-resistance, heat-tolerance and most importantly for mechanical planters — seed size. For instance, we plant a variety of corn called “Silver Queen” which has a relatively large kernel as compared to most sweet corn. We also plant a variety of field corn called “Hickory King” which has a really large kernel compared to most field corn. There lies the problem. With so much variance in seed size, how do we develop a system that can account for that variance and accurately plant each variety? Our Garden Seeder Seed Plates are made of a machinable plastic that can be easily modified to meet your needs. All you need is a drill. We like to use a “step drill bit“, but a regular drill bit will work as well. The stock plates included with each Garden Seeder have pre-drilled holes which are on the small size spectrum as far as seed size goes. This is because you can always make a hole larger, but you can’t make it smaller! A general rule of thumb is to have the diameter of the hole 1.25 – 1.5 times the diameter of the seed you are planting. This will ensure that all seeds can pass through the seed plate holes, but two seeds cannot get stuck and jam a single hole. Test Your Garden Seeder Seed Plates! Yes, this means that you will have to do a little bit of pre-planning before you plant. It doesn’t take very long and will always beat the heck out of planting by hand! Once you have the Garden Seeder Seed Plates correctly modified for a particular variety, the plate should be true to that variety year after year. If you plant multiple varieties of corn, beans or peas, we suggest having a plate for each variety. You can modify one of our pre-drilled seed plates or customize one of our blank seed plates. The great thing is that our Seed Plates are only $5.99 each, unlike some of our competitors whose extra plates are $20 – $40! So always test your Seed Plates with your seed before planting. Modify if necessary, and always keep plenty of extra plates on hand!